The following contains brief spoilers for Us, mostly in the third and fourth paragraph, so if for some reason you’e yet to see it and are waiting on the home release, you may want to bookmark this page and come back later. Nothing would bring me more pleasure than to take Us as an extended Twilight Zone episode and grapple with its ideas separate from the linear home invasion plot. At times the movie seems to court an allegorical reading, as in the mind-bogglingly hokey declaration by Lupita Nyongo’s double: “We’re Americans.” Get it? Because Us = U.S. I’m certain almost nobody else noticed this connection. As fleeting broadcasts and exposition dumps peel back the curtain on a heavily coordinated, nationwide clone uprising, Us half-heartedly masquerades as a class warfare fable, designed more to jog the moral noggin than to move logically from point A to point B. Nonetheless, Us differs significantly in practice from mother!, one of my favorite films. Whereas the latter worked as a Kierkegaardian satire staged in a malleable, figurative environment, with some Lynch and Polanski elements thrown in to distort reality even further, Us is definitively not an allegory, and so it has the added burden of maintaining some internal consistency. Most of Us’ narrative shortcomings could be alleviated by merely leaving the doppelgangers’ origins open to interpretation. There’s nothing wrong with choosing Pure Evil or Magic as the threat to be overcome; whatever deviation from our material world is necessary, audiences will generally allow it if the storyteller announces it up front. Peele sets up his grand reveal in a multitude of places: text drawing attention to a network of underground tunnels, seemingly throwaway dialogue about government mind control, a creepy zoom shot of caged rabbits all along a wall. When he does at last unveil the truth, though, I couldn’t help but wish he hadn’t. I didn’t need a real-world, rational explanation for the origins of the tethered, but since the author saw fit to provide one, such is the lens by which many will reasonably judge, and thereby reject, his text. With the exception of its opening flashback to a stormy night in Santa Cruz, freed of any overbearing music or editing tricks, Us never particularly inspires fear, nor does it earn its comedic beats as well as Get Out, which kept the horror and the humorous knuckling of liberals mostly separate yet equal, so to speak. 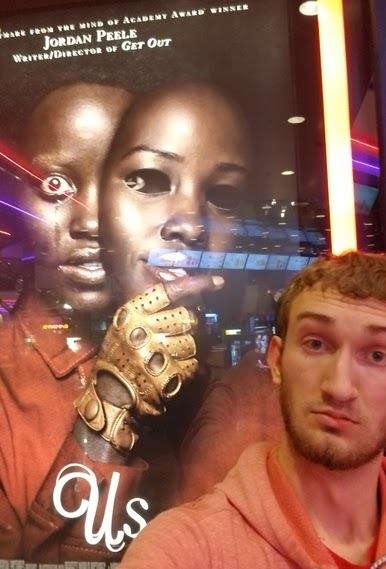 Left with a defective story occasionally elevated by inspired string sections, some cool shots, and a decent dual performance by Lupita N’yongo, the average horror fan will disassociate from the plot holes of Us by playing spot-the-film-reference (There’s Funny Games! And there’s the ’78 Invasion of the Body Snatchers!) and later gawk at the onslaught of utterly shameless rave reviews penned by professional journalists. Has another movie’s point more expertly eluded its target audience than that of Get Out? A rare film from mainline Hollywood to reach across the partisan divide, Peele’s directorial debut spoke to certain pockets of conservatism by relentlessly taking the piss out of guilt-ridden white liberals. An Obama-era update of Guess Who’s Coming to Dinner, Get Out supplants the disapproving and prejudiced family of the Sydney Poitiet original with a no less bigoted progressive cabal, who aggressively ingratiate themselves to the protagonist and flaunt their racial wokeness. “I would have voted for Obama a third time if I could,” Mr. Armitage confides to his daughter’s black boyfriend, Chris, with no pretext whatsoever. “Best president in my lifetime, hands down.” Later in the film, the visiting friends of the Armitages vocally appraise the interracial couple and make such cringeworthy, overcompensating remarks as, “Black is in fashion.” Spoiler alert for anyone who turns a blind eye to the Democrat Party’s actual perception of black Americans: all this patronizing special treatment belies a misconceived ploy to lower Chris’ guard, lulling him into a false sense of value and belonging before his liberal benefactors surgically hijack his superior black body for their own gain. Get Out, whether by accident or by design, was the ultimate rebuke to our mainstream media’s insidious language of white-knighting and two-faced racial paternalism. The hyperbole continues with the beltway’s haste to coronate Peele a perfectionist alike to Kubrick or “this generation’s Hitchcock”, two films into a career that, if he were closely following Hitchcock’s output, would have 50 more movies to assert his mettle. Peele has more in common with a mischievous satirist and remixer like Wes Craven than with the master of suspense, and I’m not even that partial to Hitch after chowing down half his filmography. Is it responsible or just to hold Peele to a lower standard as a genre director, merely as reparations for decades of horror treating people of his pigmentation as expendable? Was Obama the best president of my lifetime, hands down? If you take a film or gender class at university now, you may hear that Alfred Hitchcock was a Bad Person because he allegedly harassed Tippi Hedren, because he liked to cast actresses he found sexually attractive, or because Marnie is super Problematic. All that may or may not be the case, but at least Hitchcock never shoehorned ominous-sounding, yet largely tangential Bible quotes into his lowbrow shock films—full of murder, obsession, and men on the run—in order to goad gullible or self-effacing people into thinking they’re enjoying something deep and smart. Having been raised in a religious household that occasionally observed traditional Judeo-Christian prayer at the dinner table, I couldn’t understand this ritual, and the strangeness of it continues to bother me while writing this. If anybody who worked on the set of the movie, or anyone who identifies as a member of the “Spiritual” religion, can tell me what the heck was happening in these scenes, I will append the explanation to this review for the benefit of paying filmgoers likewise nagged by the question. Why focus so much on an aspect that will fly right over most superhero fans’ heads? For me at least, the noncommittal football prayer sequences and confusion they entailed were the most fascinating takeaway from Shazam!, which is perhaps the closest that DC has gotten to making a Marvel Cinematic Universe product: visually flat, predictable, and challenged for good humor. The major comp for entertainment writers will be Penny Marshall’s Big, which Shazam! briefly and lazily references, but the new film reminds us yet again that the 1980s were a much brasher and more offensive—ergo, more interesting—time for comedy than the hamstrung, overly sensitive 21st century. Who could forget the scene in Big where the naïve boy trapped in Tom Hanks’ body ushers a woman into his apartment for “a sleepover”, on one condition: “I get to be on top!” One of the funnier scenes in Shazam! follows the main foster kids’ endeavor to grab beer from a gas station, taking advantage of hero Billy Batson’s newfound height and manly man looks. When the boys crack open a cold one outside, we get to laugh at their subverted expectations. On the whole, though, the movie steers clear of the humorous travails of an inexperienced kid having to grapple with the responsibilities of adulthood. Billy is a superhero. Punching the bad guy harder than the bad guy punches him is about as adult as he can get. For most of its runtime, Shazam! is weightless entertainment wherein nobody with a name gets physically or emotionally hurt, and when they do, we only know because they talk about the incident afterwards. Several YouTube-based critics I watch have admonished parents over the “intensity” of scenes involving the interchangeable, bland CG ogres who are supposed to represent the seven deadly sins. Their concern rubs me as ironic, since director David F. Sandberg, a man with a background in horror, has shepherded the least horror-inflected movie in the DC canon. Between Shazam!, Justice League, and Aquaman (which I nonetheless loved as unadulterated IMAX spectacle), Warner Bros. has neutered a franchise that used to offer an eclectic, director-sculpted alternative to Disney-Marvel, clumsily broaching real-world topics like immigration, eugenics, or the Gospel. Even the foster household angle in Shazam! feels like second pickings after Instant Family, a much funnier, edgier, more holistic, and more heartfelt precis of the system that too few people saw. I have more issues with the movie, but most of them were already covered by Kyle Smith at National Review, so I won’t waste anybody’s time repackaging them. 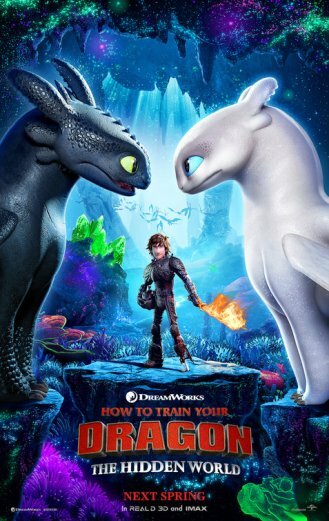 I wasn’t originally planning to write about How to Train Your Dragon: The Hidden World, the obligatory third part to the crown jewel and prime money-maker of DreamWorks Animation. Then I remembered that this series has been butting its head into the Files since the beginnings of both, and so the completionist in me feels obligated to assess the final one, not only for the benefit of DreamWorks, who have 90% of critics telling them they can do no wrong, but also for my own as a maturing writer and critic. As with many threequels that are too eager to placate fans with inflated expectations, Dragon 3 talks about twice as often as the original and communicates nary half as much. More than just a disappointing cash grab, it stands as a microcosmic case study of all the forces that have been degrading Hollywood entertainment over the last decade, one that retroactively augmented my esteem for the flawed second film. The plot of the film resembles a shambling re-animation of two long-deceased kiddie movie frameworks, viz. the forced migration from a no longer habitable home (Dinosaur, The Land Before Time, Ice Age 2, et al.) and the conniving dog napper, here re-purposed into a comically gaunt and Nordic hunter whose raison ’d’être is to exterminate all of dragonkind. When Hiccup rightly impugns his bad guy principles by pointing out that Nosferatu himself commands an army of “Deathgripper” dragons—the better to chase our heroes and create spectacle, my dear—the villain laughs the accusation off, asserting that those aren’t “real dragons” because he drugs them into obedience with their own venom. Checkmate, YouTube critics. No inconsistencies or plot holes to see here. This still doesn’t make Max Von Pseudow an interesting or empathetic figure, certainly not with an affected Transylvanian voice supplied by F. Murray Abraham, the Oscar-winning Salieri of Amadeus. As I recall How to Train Your Dragon 2, the overarching writing credo of that film was to take the message and characters of Dragon and flip them inside out. Whereas the first movie reveres Hiccup for defying the will of Chief Stoick and acting brashly in defense of what he believes to be right, the second movie reprimands him for his filial impiety and air-headed millennial hubris. In 2014, I didn’t take fondly to this twist because it seemed to come at the contrived expense of Hiccup, a young man who’d demonstrated a certain composure and critical outlook. Having now seen the full trajectory of the series, I can commend the second installment for having the gumption to do anything with the main character—integrity be damned. Hiccup’s principal motive in Dragon was to effect peace between the Vikings and the dragons, while in Dragon 2 it was to avert an imminent war between Berk and a barbaric chieftain, whom he mistakenly believes will be privy to negotiation. Both of these drives speak to a deeper value in his character and are ripe for both personal and political exploration. In Dragon 3, Hiccup is moved to find a new home for the dragons because Berk has simply gotten too crowded. Along this journey, he tries to set Toothless up with a female night fury by pure coincidence and at no discernible cost to himself, while other thankless characters like his mother urge him to join the unconditionally supportive Astrid in marriage, a union he doesn’t protest at any point. These threads make for a stunningly inert narrative wherein neither Hiccup, nor his mannequin of a girlfriend, nor the unrelatable paleface antagonist undergo any development or have to make hard decisions. Remember how Disney shills insecure in their admiration of a children’s movie played up the angle that Toy Story 3 was intended more for adults than the kiddos: that Pixar was deliberately catering to college students who grew up with the VHS tapes or Gen X dads moved to tears by dredged-up childhood memories? DreamWorks landed themselves in a similarly opportune moment with this franchise, which has charted such familiar domains of adolescent development as first crushes, death in the family, and assuming responsibility for people besides oneself. The Hidden World should have been the chapter where Hiccup and Astrid, if not consummate their love on a fur pelt in a vivid anime interpolation, at least have a stern, mature conversation about his roommate Toothless and whether it’s time for the best friends to separate and start their own families. Instead of advancing the nuanced human relationships that arguably pushed Dragon to the top of the DreamWorks pyramid, writer-director Dean DeBlois took the easy route and focused on a nonverbal mating game between two adorable, wide-eyed fairy tale creatures. It appears the easy route might have reaped the greatest spoils, as trailers emphasizing the meet-cute of Toothless and the girl dragon helped Dragon 3 capture the best opening weekend of the trilogy. Granting this is a trivial cartoon made for children with no insight to proffer on the human condition, can The Hidden World get any credit for the dragons? The first movie achieved a fine balance of making the Vikings’ nemeses colorful and loveable but also nonhuman and dangerous. One could understand why the warriors dreaded the beasts even while rooting for Hiccup to show them the error of their ways. By the time we get to Dragon 3, commercial interests have swallowed any mythical grandeur, physicality, or distinctive traits left to the dragons, reducing them to a throng of loveable doglike pets ready to be peddled as plush toys and action figures. Toothless gets to keep some smidgeon of personality, but he himself suffers an anthropomorphic makeover, no longer believable as a legendary king among monsters. A lot of people have lauded the animation work in Dragon 3, the lowest-budgeted entry, as the best in the series, in large part because Toothless draws a picture in a sand bank that looks exactly like real sand. If higher polygon counts or more realistic hair and grass are someone’s main metric of good animation, then I wouldn’t know how to convince such a person that Dragon’s animation has visibly soured over the years. When Incredibles 2 came out, some critics seized the occasion to note how far CGI has advanced since the comparatively rudimentary Incredibles; how long will it take popular consensus to grow disenchanted with the computer graphics in DreamWorks’ grand finale? Preoccupation with 3D animation “detail” or “realism” seems a uniquely American foible. Films like Akira, Ghost in the Shell, and Princess Mononoke look just as impressive today as they did in the ’90s, having put most of their chips in technology that isn’t aging rapidly. Even the first Dragon can lord its darker, more intricate lighting and shadows over The Hidden World, which continues to repaint the world with a sunny, candy-colored palette more reflective of competing cartoons. So goes the humor in the third part of a critically-acclaimed animated franchise. AFOD’s (adult fans of Dragon) used to be able to tune out these minor characters, as their idiocy was incidental to the plot. In Hidden World, their mishaps—a brother abandoning his sister in battle because they hate each other; said sister assuming the bad guy let her go with no intention of secretly following her—are actually integral to it. Somewhere over the course of watching the movie and mentally drifting off from boredom, it occurred to me that there has never been a truly good animated sequel in the West, and DreamWorks’ series makes it blaringly apparent why. As a new IP that early adopters had no guarantee would satisfy them, How to Train Your Dragon had the luxury of being able to make risky choices concerning its characters, choices that endowed their actions with moral significance. In the DVD commentary track, the creators talk about the positive reaction at test screenings to Hiccup’s amputation at the end; one child appreciated that the protagonist “lost something, but he gained so much more”. The Hidden World doesn’t have the same benefit because the filmmakers have to skirt around inflicting terror upon children, who are conditioned by witless media outlets and a consumerist culture to “identify” with or “look up to” unattainable fantasy characters. How can a director like Deblois sleep knowing that he may have corrupted, maimed, or misrepresented a figure who brings joy to millions of people? It’s easier just to do nothing with him. In How to Train Your Dragon, Hiccup’s courage and commitment to Berk cost him a limb. In Dragon 2, his arrogance cost him his father, even if Stoick’s death didn’t loom over the film to a great extent. In Dragon 3, Hiccup tries to sacrifice his own life to save Toothless, but ten seconds later the movie saves them both miraculously anyway, Last Jedi-style. Some days later, Hiccup marries Astrid and says a final goodbye to Toothless, himself involved in a serious relationship with the girl dragon. Here the movie could have ended on a beautiful callback to the first film’s training scene, signifying that our friendships irrevocably change and bless us even when our friends must journey elsewhere, never to see us again. The Hidden World, however, is too coy to end on such a poetic note, or to suggest that the hero’s best friend could actually be his wife. Instead we get a manipulative, happy-go-lucky epilogue in which a bearded Hiccup and his offspring reunite with Toothless and his offspring and they all go flying together above the clouds while John Powell’s theme music swells. Nothing ventured, nothing, for me at least, gained. 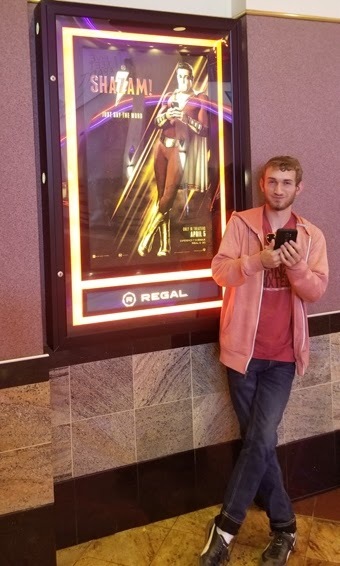 The CGI was good, though, so I’ll give it an A-, slightly below what I gave Captain Marvel, which is also decent and entertaining despite its slight deficiencies in comedy, drama, romance, action, suspense, acting, writing, editing, cinematography, makeup, and shot composition. Please support these films.